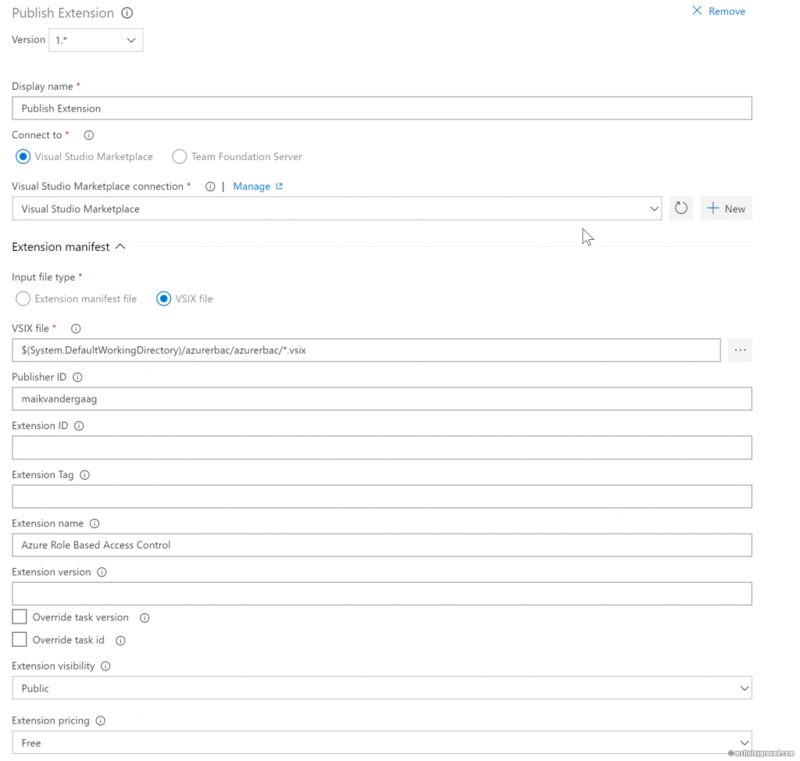 Azure DevOps Extension Tasks: Task made by “Microsoft DevLabs” for constructing Azure DevOps extension packages and deploying them to the marketplace. Version number counter: Task made by myself that will help with controlling the version number of the extensions. More information about this task can be found on my blog. 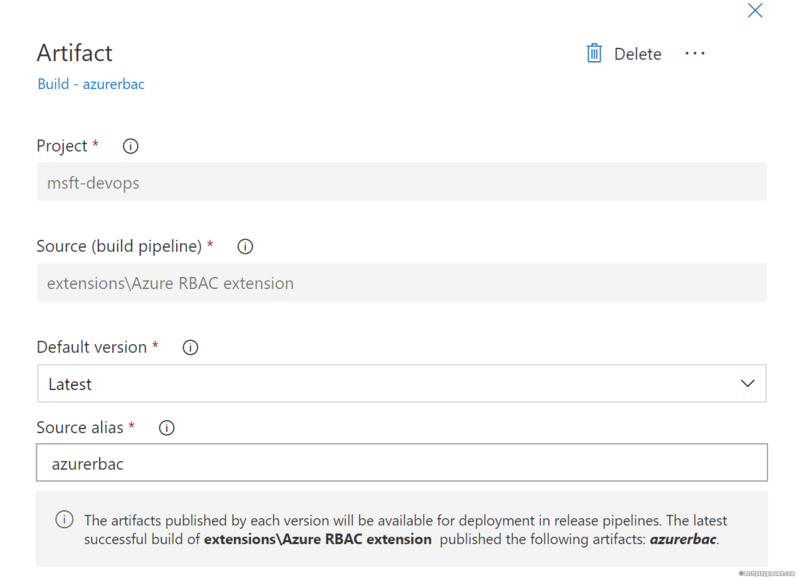 With the extensions installed create a new build pipeline. In the new build pipeline window choose the visual designer option. In the screen that follows choose GitHub as we will use GitHub as the source location. If you want to use Azure Repos that isn’t a problem. Authorize the connection and make sure you select the correct project and branch. The build pipeline will open up. The first thing we will configure is the trigger of the build. Because I save multiple extensions within the same repository I have enabled the “Continuous Integration” option and also apply a branch filter and a path filter. The path filter is used to make sure the build is only started when something has changed within the specified path. Next up are the “Variables”. We add a variable called “buildversion” that the “Version number counter” extension will use to increment the version number. Besides that the variable will be used as the build number format (under the options tab). With all these configuration setup we can start adding tasks. For this build pipeline we will use three tasks. This extension will be used to increment the version number of the extension. The option “Automatically update minor number” is disabled because I want to update this number manually. Packaging a extension into a vsix file is done via this extension. In this extension we override some specific values like the “publisher” and the “extension version”. The extension version is overwritten with the $(Build.BuildNumber) which is the same as $(buildversion) that we increment each time a build runs. The last task will be used to save the package to the artifact location called “azurerbac”. The path that will be published is a variable called: “$(Extension.OutputPath)”. This variable is a output variable from the “Package Extension” tasks and represents the location of the vsix file. This completes the Azure build pipeline. You can test your pipeline by queuing the build. In a new release pipeline add a artifact. For simplicity set the “Default version” to “Latest version” and add a short alias name. Make sure the artifact will trigger the deployment of the stage that will be added during the next step. In the release add an empty stage and add a single task named: “Publish Extension”. 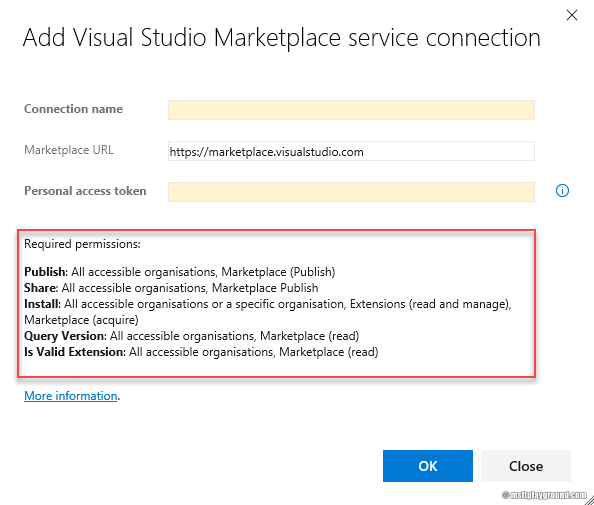 To get this extension up and running a Visual Studio Marketplace service connections needs to be added. Do this by clicking the “New” button next to “Visual Studio Marketplace connection” when you just added the tasks to the stage. To use this connection type you will need to generate a Personal Access Token for a user that has access to your Marketplace. The specific PAT requirements are shown at the bottom of the image. With this configured you can setup the task completely. Pay good attention to the visibility and pricing parameters of the task. Save the release pipeline and run the complete process when complete you will notice that your extension has been added to the Visual Studio Marketplace. When this is up and running you can easily extend the pipeline to also deploy a private version of your extension the complete pipeline could look like the image below. I am struggling with how to do a canary deployment for a private Azure DevOps extension. My extension is shared with a dozen or so organizations and now I need to update it. However, I would like to do a canary deployment to 1 or 2 organizations that are willing to validate the update before sharing it with the rest of the organizations. From what I read the Azure DevOps Marketplace will immediately share the update with all organizations that have the extension installed as soon as I publish an update. Am I misunderstanding this? Is there a way to do a canary deployment for a private extension that I am missing? You are right that updates to the marketplace are pushed the organizations that have it installed. What you could try is setting up another publisher to be able to push new versions to and install the extension for those organizations. This could be a private instance as you can push the installation of the extension. If you would like more assistance please let me know. Maik – Thanks your prompt reply. I posted this same question in multiple places (a bit of hypocrisy on my part because I don’t like it when the developers I support do that to me — so apologies for that). In one of the other threads, i.e. https://github.com/Microsoft/vsts-extension-build-release-tasks/issues/129 , you will see that Jesse proposed that I do something similar except, when I expressed concern about the task GUIDs being duplicated, he indicated that it would be ok as long as “the tasks are private and by the same publisher”. Thoughts? That is a good suggestion. Personally I would split my publisher, but everything really depends on all your exact requirements and what you try to accomplish. 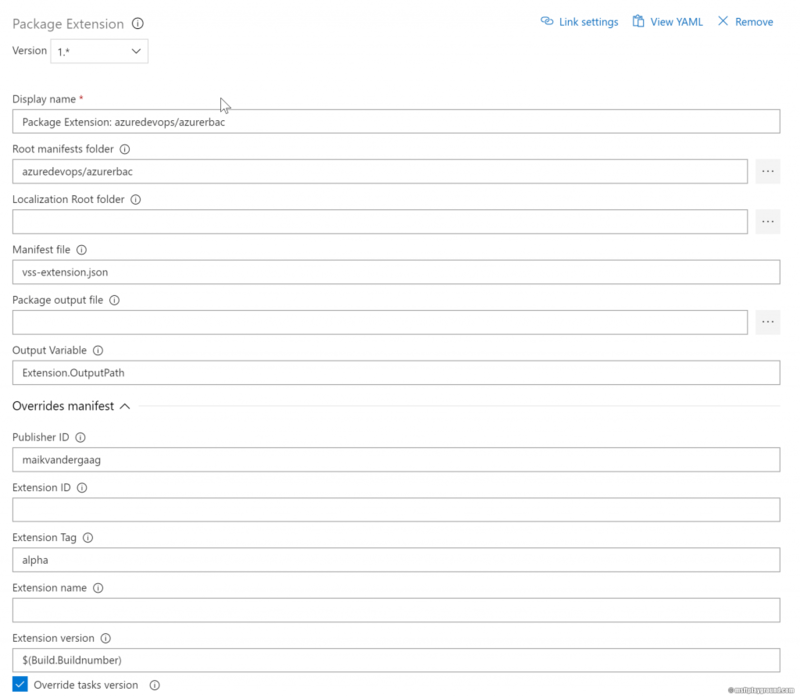 With the extensions for Azure DevOps you have a lot of possibilities to steer the complete process.